A new report detailing the production of China’s televised “confessions” has pointed the finger at media outlets, accusing them of being active collaborators of the state. Human rights organisation Safeguard Defenders urged countries to take action against the international arms of Chinese state media as a response. Televised confessions are routinely forced and extracted through threats, torture, and fear, the report released Tuesday said. It added that they amount to human rights violations that warrant urgent global attention. “Media organizations that film, collaborate with police in the staged and scripted process, and broadcast these confessions, whether they be Chinese state media or private outfits, are as culpable as the Chinese state in committing this deceptive, illegal and human rights violating practice,” the report said. The report, based on interviews and written testimonies from former detainees, as well as analysis of confession videos, said state media outlets broadcasting the confessions were often active participants in the process. They asked police-provided questions, concealed the circumstances in which the confessions took place, produced sophisticated news packages, and conducted interviews with police and commentators to paint the suspect as guilty. The report said televised confessions were mostly aired on state broadcaster CCTV. In 2016, state-funded news portal The Paper posted the “confession” of Wang Yu – the first detainee in China’s crackdown on human rights lawyers and activists in 2015. Wang’s confession, in which she claimed that foreign forces used her law firm to tarnish China’s reputation, was also posted by Hong Kong media outlets Phoenix TV and Oriental Daily. 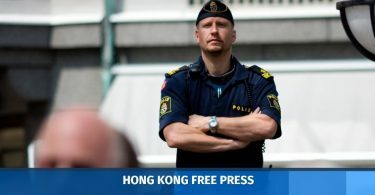 Peter Dahlin, a human rights activist who was detained in a “black prison” for 23 days in 2016, and whose confession was aired on state TV, told HKFP the media’s active collaboration was worrying. “When you see Iranian state TV people sanctioned by the EU for doing the same, on a much lesser scale, and you see Russia Today forced to register under the foreign agents registration act in the US, it’s worrying, because in China this is systematic, yet they ‘get away’ with it with little to no debate,” Dahlin, whose testimony is featured in the report, said. Gui’s comments were point-by-point rebuttals of criticism and other attempts to intervene by the Swedish and others, Dahlin said. Those interviewed for the report said they would be told what to say either through learning lines, reading from a script, or agreeing with captors about what to say. There would be multiple takes until the security officers were satisfied. “All of it was choreographed, and the whole thing went on perhaps seven hours, with so many retakes I can’t remember for sure,” one interviewee identified by the pseudonym Wen was quoted as saying. Another identified as Zhao was ordered to cry on camera. The report said authorities would use mental and physical torture, or threaten detainees or their loved ones to elicit confessions. Lawyer Wang Yu said she agreed to confess after she was shown a photo of her son in detention after he tried to flee the country, though she had resisted previous efforts to make her confess. The 12 people interviewed in the report all said their interrogators had forced them to confess. Some were not told that the video would be broadcast on television. The report revealed that the taped confessions often concealed the circumstances of the interview. In the case of Peter Humphrey, a British investigator who was detained for nearly two years, he sat in handcuffs in a locked iron chair inside a steel cage, with spotlights and camera lenses poking through the bars. The media were not allowed to ask questions. Only the upper part of his body was visible in the footage aired on TV. 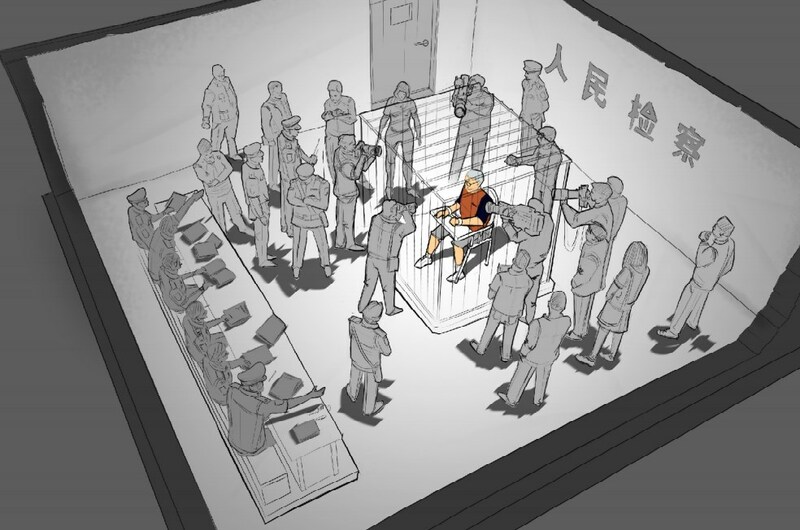 An artists’ impression of how Peter Humphrey’s televised confession was set up. Artwork: Alexey Garmash. Safeguard Defenders said international media has an obligation to report ethically and responsibly on such confessions by adding crucial background that the practice violates human rights and Chinese law, and are likely a vehicle of party propaganda. It also urged overseas governments to use tools and legislation to take action against the Chinese media – especially state broadcaster CCTV and its channels, which it identified as the main vehicle for the televised confessions. HKFP has contacted China’s Ministry of Foreign Affairs for comment.